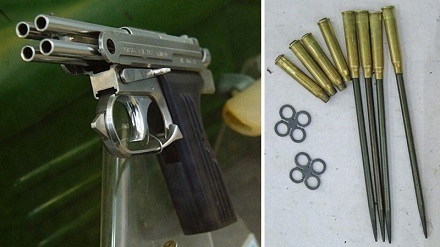 The SPP-1 is a Cold War-era firearm of Russian make, designed specifically for use by Soviet Frogmen. It fires 4.5mm steel darts from four individual barrels. The pistol uses a double action firing mechanism and fires each barrel one at at time, with the striker (mounted on a rotating base) rotating to each barrel as the trigger is pulled. Also developed was the Avtomat Podvodnyi Spetsialnyi, an underwater assault rifle that fired 5.66mm darts and was fed using a 26-round detachable box magazine. Of course, the Soviets weren’t unique in their development of multi-barreled underwater firearms: the Underwater Defense Gun Mark 1 Mod 0 and H&K P11 were designed and used by the United States and allied nations for similar purposes. Tags: Gizmodo, Gun Pr0n, Media, WTF?